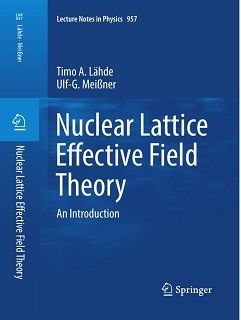 As a major outcome of the work on nuclear lattice effective field theory in the projects B.6 (first funding period) and B.9 (second funding period), a monograph was just published by Timo A. Lähde (associated scientist) and by Ulf-G Meißner in the Springer Lecture Notes in Physics Series as volume 957 (May 2019). The 13th International Workshop on Heavy Quarkonium will take place at Cavallerizza Reale, Torino, Italy, in May 13-17, 2019. For more information, details and registration we refer to the workshop webpage. We congratulate our PI Feng-Kun Guo (ITP/CAS) who has been promoted to full professor, based on his great scientific contribution to the CRC. since the CRC started in July 2016. On March 16th and 17th, 2018, we performed the Bonn Particle Physics Show in the Wolfgang-Paul Lecture Hall of Bonn University. Both performances were sold out (2x 550). 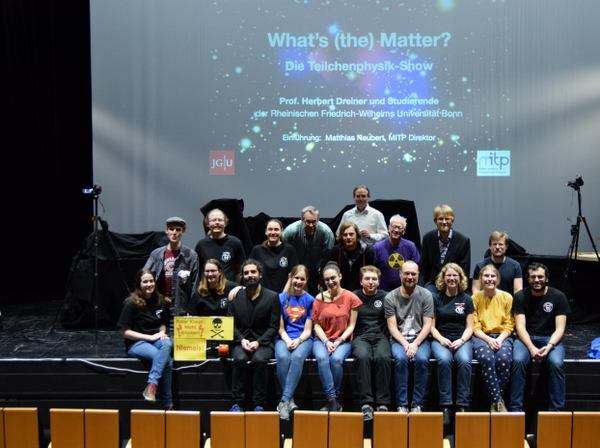 On March 19th, upon invitation of Prof. Matthias Neubert, the director of the MITP (Mainz Institute of Theoretical Physics), we performed the Particle Physics Show in the Mainz Staatstheater (see photo). This performance was also sold out. It was an amazing experience to perform in such a professional theater. From Sept 17th-21st, we were guests of Professors Gui Rebelo and Gustavo Branco at Instituto Superior Tecnico in Lisbon. We performed the Particle Physics Show in the main physics lecture hall. Guests included the president of Tecnico, Professor Arlindo Oliveira, as well as the president of the Portugese Physical Society, Prof. Maria Teresa Peña. In Lisbon we also held a workshop in public presentation of science for the local particle physics students. This trip was partially supported by EU-COST Action CA15108. From Sept 21st-25th, we were guests of the IFT Madrid (Institut of Theoretical Physics). We performed the show three times in the Caixa Forum, a wonderful museum in downtown Madrid. Our host was the director of the IFT, Prof. Angel Uranga. Again all three shows were sold out (3x 420). The highest award within the CAS President's International Fellowship Program (PIFI), the Distinguished Scientist Award, was bestowed upon Ulf Meißner for the year 2018. [link to the Uni Bonn website] Connected to this prize was a lecture series on "Strong Interactions'' that was held at the ITP on April 26-28, drawing a sizeable crowd. Three-body hadronic decays of heavy mesons and the tau lepton are important tools for studying both meson-meson strong interactions and weak dynamics in a wide energy range, from pi-pi threshold up to the B-meson mass around 5 GeV. With the recent increase of experimental precision achieved by LHCb, BESIII, COMPASS, and in the near future by the Belle II experiment, data require more refined theory-based amplitudes in order to interpret the underlying dynamics. In this context, our workshop will join theorists and experimentalists in order to discuss different issues concerning final-state interactions in amplitude analyses in three-body decays of hadrons and leptons. The format of the workshop is meant to offer a fruitful environment for discussions and exchanging issues and developments among experimentalists and theorists. We want to favor the interplay between both sides in order to arrive at productive conclusions. For more information, details and registration see the webpage. Prof. Mei Huang (IHEP) was awarded the "The NSFC Outstanding Youth Grant" which is the most prestigious and competitive grant from NSFC for individual researchers below the age of 45. Andria Agadjanov (Univ. Bonn) is the recipient of the 2016 "Dr. Klaus Erkelenz Preis'' for his thesis on "Hadronic Electroweak Processes in a finite volume''. Dr. Jordy de Vries (former CRC 110 post-doc) will take an assistant professor position at UMASS/Amherst in 2018. The first general meeting of the CRC 110 in the second funding period took place in the School of Physics at Peking University from August 29 to 31, 2017. The meeting consisted of short review talks about the scientific and the outreach projects by the German PIs (with the a few exceptions) complemented by talks from Chinese students and Post-Docs, that gave more details about certain subprojects. All except 3 German PIs and all Chinese PIs took part in the meeting, in total, there were 105 participants [photo]. This early meeting served to get to know each other better and to start or deepen the sino-german collaboration. In addition, 6 Chinese reviewers and two high-level persons from the NSFC were present. Altogether, the meeting left a very positive impression as already quite a number of interesting results have been obtained after just 13 months of the second funding period. For details, see the webage http://indico.ihep.ac.cn/event/7079/overview. For the third time since 2015, Ulf-G. Meißner has been awarded a Visiting Scientists Scholarship under the CAS President's International Fellowship Initiative (PIFI), this time to perform investigations for about a month at IHEP (the two earlier PIFIs awards were linked to the ITP). The CRC workshop on Nuclear Dynamics and Threshold Phenomena will take place in Bochum, April 5-7, 2017. For more information,details and registration see the webpage. The 12th International Workshop on Heavy Quarkonium will take place in Beijing, China, Peking University, November 6-10, 2017. Symposium "Advances in Effective Field Theories"
At the symposium "Advances in Effective Field Theories",that took place at the Forschungszentrum Jülich from November 7 to 9, 2016, the world's leading experts on effective field theories in the areas of hadronic and nuclear physics presented their research. This also served as a CRC meeting in these areas. A special focus of the symposium was on the numerous contributions Prof. Ulf-G. Meißner has made to these fields. He was awarded the Lise Meitner Prize earlier this year. On the second day of the symposium Prof. Meißner received the medallion and diploma associated with the prize. The DFG and the NSFC have approved the second funding period for the CRC in June. It will run from July 1st, 2016, to June 30st, 2020. The CRC has been extended. We have two new nodes, the Ruhr-Universität Bochum, Germany, and the Institute of Theoretical Physics of the Chinese Academy of Sciences, Beijing, China. The number of research projects has increased from 13 to 18 (without Z-projects), with an increase in PIs from the German side from 14 to 21 and 10 to 13 on the Chinese side. We welcome all the new PIs and look forward to intense collaborations in the years to come. The 2016 Lise Meitner prize of the European Physical Society for outstanding work in the fields of experimental,theoretical or applied nuclear science was awarded to Ulf-G. Meißner for "his developments and applications of effective field theories in hadron and nuclear physics, that allowed for systematic and precise investigations of the structure and dynamics of nucleons and nuclei based on Quantum Chromodynamics''. From March 15th to March 23rd, 2016 Prof. Herbert Dreiner and the Bonn Physikshow travelled to Beijing, to train local Chinese physics students in show physics. The Bonn University team consisted of seven physics students (Jana Bürgers, Timo Heepenstrick, Katharina Hortmanns, Christian Jost, Johannes Müllers, Steffen Schaepe, Laura Weber) as well as Michael Kortmann, the technician responsible for the extensive demonstration experiment collection in Bonn. In a short 5 day workshop we trained fifteen Chinese physics students from the Institut for Theoretical Physics at the Chinese Academy of Sciences as well as from Peking University (PKU) to put on their own show in Chinese. The workshop ended in a public show at PKU put on by the local students in Chinese and using local equipment from the PKU collection. About 150 Chinese high school students attended the show, which was a huge succes. In a blog post on the British newspaper Guardian’s website, Prof. Dreiner tells the story. The program "Clustering effects of nucleons in nuclei and quarks in multi-quark states" took place at the Kavli Institute for Theoretical Physics at the Chinese Academy of Sciences in Beijing, from March 28 to April 22, 2016. The program consisted of daily talks and discussion sessions. It was partly organized by members of the CRC. 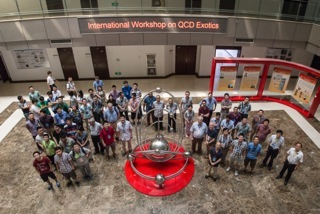 The "International Workshop on QCD Exotics" was held in Jinan, China, on 8-12 June, 2015. The meeting was hosted by Shandong University and jointly organized by the Institute of High Energy Physics, Chinese Academy of Sciences, Shandong University, and by members of CRC 110. Prof. Qiang Zhao (IHEP) was awarded the "The NSFC Outstanding Youth Grant" which is the most prestigious and competitive grant for individuals below the age of 45. Dr. Feng-Kun Guo (Bonn) was awarded the grant for "The Thousand Talents Plan for Young Professionals", one of the most prestigious grants in China for researchers below the age of 40. Dr. Wei Wang, former postdoc in the CRC 110 (Bonn), now assistant professor in Shanghai, Jiao-Tong University, was awarded the grant as well. Six VENI-grants for young talented physicists: The NWO (Dutch organization for scientific research) has awarded six young physicists a prestigious VENI-grant. These physicists are part of a larger group of 161 researchers that can develop their scientific ideas in the upcoming three years. A VENI-grant corresponds to an amount of maximally 250,000 € and is one of the financing methods to stimulate young scientific talent in the Netherlands.. Dr. Jordy de Vries (FZJ) was awarded the grant for his proposal "Heart of Darkness: Unraveling the nature of Dark Matter". 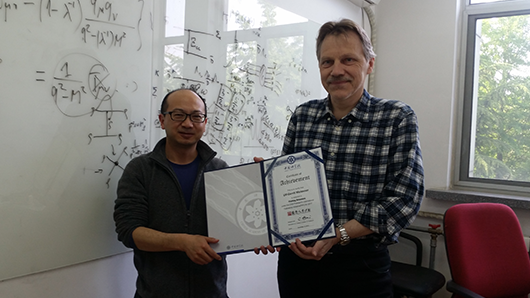 Dr. Qian Wang was awarded “The Excellent PHD Thesis of the Chinese Academy of Sciences, 2015 ” which is the most prestigious award to CAS students. The program "Present Status of the Nuclear Interaction Theory'' will take place at the Kavli Institute for Theoretical Physics at the Chinese Academy of Sciences in Beijing, from August 25 to September 19, 2014. The program consists of daily talks and a variety of introductory lectures given by world-leading experts. It is partly organized by members of the CRC. The International Workshop on Heavy Quarkonium 2014 will take place at CERN, on November 10-14 2014. The general meeting of the CRC 110 took place in Weihai, China, from July 25 to July 29, 2014. The meeting place was the Shangdong University Academic Center Hotel, next to Weihai's International Beach. The meeting consisted of talks by german students and post-docs on the status of the various projects, a midterm review of the contribution form the Chinese PIs and talks from prospective new PIs for the second funding period (FP 2) as well as associates of the CRC. Also, a road map for FP 2 was worked out and a meeting of the board of the CRC took place. From the Chinese side of the CRC, we had 9 PIs, 4 post-docs and 24 students participating. From the German side, there were 9 PIs, 9 post-docs and 10 students. Various associates of the CRC, Chinese reviewers, invited guests as well as NSFC representatives were also present. In total we had 56 Chinese and 32 German participants. There was ample time for discussion and recreation on the beach. 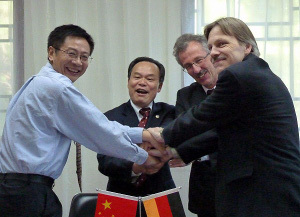 As a first step for a common graduate education, two MoUs were signed between the Faculty of Mathematics and Natural Sciences of Bonn University and the Institute for High-Energy Physics (IHEP) of the Chinese Academy of Sciences (as PDF). The signing ceremony took place on March 21st. The photo shows Prof. Yifang WANG, the IHEP Director and Prof. Ulf Meißner, the Dean of the Faculty of Mathematics and Natural Sciences, after signing as well as members of the CRC and IHEP officials. The first common graduate student is Dr. Martin Cleven, who was co-supervised by Prof. Christoph Hanhart (FZJ), Prof. Qiang Zhao (IHEP) and Prof. Ulf-G. Meißner. See also the news on the IHEP website (link). A two day workshop on strangeness and related topics took place at the ECT*, Trento, Italy, consisting of 5 review talks and one round table discussion on open topics in hyper-nuclear physics. The talks can be found on this page. We are happy to announce that Carsten Urbach has been appointed as W2 professor for Theoretical Physics in the HISKP, succeeding Hans-Werner Hammer, as of October 25th, 2013. Hans-Werner Hammer has moved to TU Darmstadt as of August 1st, 2013. We wish him good luck at his new work place. Hans-Werner Hammer is still involved in projects A.3 and B.1. On Thursday, June 27th, a delegation from the DFG, the NSFC and various other asian funding agencies visited the HISKP to learn about the CRC 110. Two introductory talks were given by Ulf-G. Meißner ``Introduction to the CRC 110'' and from Feng-Kun Guo ``Why do we need the CRC 110 - a personal perspective''. Various issues of funding projects between the different countries were discussed. This informal meeting just preceeded the first anniversary of the CRC 110 on July 1st, so it gave a good opportunity to assess what has been achieved so far. Beginning of June the DFG funded GPU cluster QBiG started operation in the HISKP at Bonn. It comprises a total of 48 newest generation NVIDIA GPUs with an integrated peak performance of 56 TFlops in double precision and 168 TFlops in single precision. The infiniband network allows for efficient parallel execution and a fast connection to 70 TByte of available RAID disk space. Christoph Hanhart has been appointed as "APL Professor"
Christoph Hanhart has been appointed "außerplanmäßiger Professor" at Bonn University starting May 10, 2013. Bastian Kubis has been appointed as a fixed term W2 professor at the University of Bonn starting March 1st, 2013. April 27th to 28th 2013 the CRC will organise a workshop on threshold phenomena in Beijing, China. Please find details of the workshop and the registration page on the workshop web-page!